After breakfast, we said our good-byes to Milan and Eric and caught the 10:30 bus to Ptuj (700 SIT). It was an easy ride through farms and vineyards to Slovenia's oldest city. We arrived at 11:55 and walked from the bus station to the Hotel Mitra. We passed through much of the medieval core - we couldn't wait to get settled and go about exploring this charming town. Eric had reserved our room at the hotel, which is the newest, located on Presernove Ulica in the heart of the town. Boris Toplek greeted us at the front desk, a cheerful, extremely helpful young man who did everything possible to guide us and make our stay comfortable. This is a very nice, basic 3-star hotel. There's no elevator but Boris is happy to help with your bags. The room was very clean and spacious with basic, but nondescript furniture and the good-size bathroom had a stall shower. The lobby is small and the buffet breakfast is served in the adjoining dining room. Ptuj is a delightful place with pedestrian-friendly streets and wonderful old buildings dating as far back as the 12th century. The major attractions are in and around the two main squares, Slovenski Trg and Mestni Trg and along Presernova Ulica. 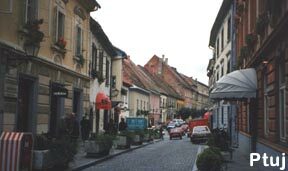 Running south to the River Drava are narrow, cobblestone streets filled with shops, restaurants, homes and assorted businesses. We managed to squeeze-in pastry and coffee at Butik just up the street from the hotel. Down at the river, we found the restaurant Ribic, famous for seafood, to which we returned for dinner after a rest at the hotel. It's a large place, with indoor and outdoor seating (indoor this night - it was raining). The nautical decor is appropriate to its riverside location. This "best restaurant in town" was a major disappointment. The mushroom soup was bland, the calamari and trout couldn't hold a candle to others we'd had, the vegetables were overcooked and the mixed salad was boring. The highlight of the evening was meeting and chatting with a couple at the next table from Brighton, England. He was a Croat and they were on their way to visit his family. The included breakfast was very nice and we were served eggs that were made to order for us. We watched the kitchen staff rolling out a massive amount of dough for the homemade apple strudel. We hit the cobblestone streets and headed for the Dominican Monastery which houses an interesting archeological display. Our next stop was at the castle which sits above the town in which there is a regional museum displaying feudal habitation culture, a Gothic and baroque art gallery, a musical instrument collection and a weapons collection. We had excellent English-speaking guides in both places. As we walked along Slomskova Ulica, the smell of freshly made pizza at #20 lured us inside. How lucky! The wonderful crust was topped with Slovenian cheddar-type cheese with tomato, onions and olives and a rich tomato sauce nicely blended in. Every place has its own style of pizza and this one would be easy to adopt. The basic size is large enough for sharing and Radenska water was our beverage choice. We crossed the bridge to the southern side of the River Drava and walked to the Terme Ptuj. It was a nice, sunny day and a pleasant walk along the river. The spa is just opposite the town. It is a low-rise, small facility offering nice apartments, bungalows and camping accommodations. There are indoor and outdoor pools and other recreational facilities. It is a good alternative to staying in the city. We wandered into Gostilna Rozika at Slomskova 7 for dinner. A low-key bar/pizza/restaurant where locals go for typical dishes at low prices. The ingredients were nice quality but the care in preparation was lacking so the overall impression fell short of excellent - but it was still a decent meal for a very fair price. With soups as starters, Linda had Wiener schnitzel and I grilled pork chops, with an over-dressed mixed salad. I had gibanica for dessert, this version filled with crushed nuts, poppy seeds, apples and cheese. We had breakfast with the first Americans we met on the trip - a couple from Delaware. They, too, were very impressed and pleasantly surprised by what they had found on their visit to Slovenia. We had a long travel day ahead of us. We were heading due west to the Adriatic and the seaside town of Piran. We were scheduled to leave Ptuj by train at 11:44 and arrive in Ljubljana at 14:05 (984 SIT), we'd then catch the 15:00 bus to Piran arriving at 18:00 (1,340 SIT). The train was an hour late but, fortunately, the bus was late also, so we left Ljubljana at 15:35 and arrived in Piran at 18:30. Both the train and the bus were completely full. It was Friday and folks were heading home for the week-end - particularly students. We met an interesting chap on the platform at Ptuj - an architect who was working in Ptuj building a running track (his specialty) who was heading home to Nova Gorica near the Italian border. He was also a writer and philosopher and the train ride passed quickly as Goran shared his views on Slovenia and on life. The bus was filled with university students from Ljubljana. One of the many stops was at Postojna which is famous for its caves. As our bus headed down the mountain from Kozina, we got our first glimpse of the Adriatic and the Italian city of Trieste. We rolled into Koper, a port city just south of the Italian border, and then through Izola, a cute seaside town. The stop before Piran was Portoroz, which is the major tourist town on this seacoast strip, and we drove by the impressive Portoroz marina. The bus station in Piran is right on the waterfront. We walked along the embankment about 100 yards to the center of the town, Tartinjev Trg, the bustling square which faces the harbor and the marina. The sun was setting on this precious, well-preserved jewel; Piran sitting at the top of a narrow peninsula is a feast for the eyes. We headed to the Hotel Piran and were given a room right over the water - but it was not up to the standards we prefer. We walked over to the Tartini Hotel, right near the main square. It's the best hotel in town and it's owned by the same people who own the Hotel Piran. We lucked out! They had just had a cancellation. Eric had tried to get us a reservation here originally, but it was fully booked at the time. They called The Piran and arranged for us to leave there without a charge. The receptionist at the Tartini Hotel was another happy, smiling, accommodating person (not so the man at Hotel Piran who was just the opposite). The design of the Tartini Hotel is ultra-modern - in fact, kind of tacky in its bright and funky attitude. But the space is okay, it's clean and the price is reasonable. This is a gorgeous town and it's a very popular tourist destination during the summer months. It is surprising that the accommodations haven't been upgraded. Our plan was to be in Piran for two nights, but we discovered upon arrival that there is no Sunday bus to Trieste this time of year. So - one night it is, with an extra night in Trieste - no problem. We were quite hungry after the long travel day. The helpful receptionist recommended the Gostilna Galeb, Pusteria 5, and guaranteed we'd be pleased. It was a delightful walk along the seashore around the peninsula, passing many seafood restaurants, the lighthouse at the very tip, and a short while later we reached the restaurant. It is a tiny place - 5 tables - but luckily one became available just as we entered. It's a family operation; Savo Ristic is in the kitchen and his wife is out front taking care of the customers. A brick archway separates the kitchen from the dining room which is stucco with wood trim and white lace curtains. The red wine and dense, yellow bread were great starters. We ordered our last bottle of Radenska mineral water knowing we'd be missing it the next night. Both Linda's grilled scampi and my grilled sea bass were superb - fresh and perfectly seasoned with parsley, garlic and olive oil. Homemade French fries and boiled potatoes and the usual, excellent mixed salad, complemented the meal. It was a superb last meal in Slovenia. Slovenia is a seafood lover's paradise - fish is plentiful, well-prepared and reasonably priced. We walked back through the town through clean stone streets lined with 3-5 story homes, ancient and leaning tightly against each other for support. Enveloped by the salt air, we drank in the wonderful flavor of the old world. Suddenly we emerged into Tartinjev Trg, all lit-up and stunningly beautiful in the night. Okay, so last night's meal wasn't the last, we enjoyed a very good buffet breakfast. We were getting the 13:25 bus to Trieste (520 SIT) which arrives AT 14:30. We hastened to walk the town. There was a band playing in the square which helped to get us moving. We wandered around the narrow streets and hiked up to the church of St. George, high above the town for excellent views of the town and the waterfront - a stone wall providing Linda's "tripod". We managed to work in a stop at Slascacarn Piran at the marina for an apple strudel and a cream slice with cappuccino - Oh, I hate leaving! With our last remaining SIT, we went into a grocery and bought a jar of peppercorns and three pieces of bubble gum, which completely wiped us out - we had been warned that the SIT only has value in Slovenia. Earlier on, we had stopped into an antique store not far from the bus station. As we headed to the bus station, the woman in the store spotted us, suitcases in tow, through her front window and began to wave frantically, as though we were friends of hers leaving town for awhile. A wonderful gesture, reflective of the way we too had come to feel about the friendliness and warmth of all the people. We took that warmth with us - but we'll bring it back! P.S. I had inadvertently left my "pool shoes" behind at the Park Hotel in Bled. They were waiting for me in Toronto when we got home.